Radical Waters Granted Beverage Patent in Brazil. Radical Waters International Ltd. was first granted an innovative beverage patent in the USA for Cleaning in Place (CIP) in bottling facilities in July 2012. Brazil is the most recent country to grant a beverage patent to Radical Waters for its pioneering Electrochemically Activated Water (ECA) application for use as a substitute to traditional CIP chemicals for the global beverage industry. The beverage patent granted in Brazil relates to the use of ECA in the beverage manufacturing, processing, packaging and dispensing of beverages. Specifically, to the use of ECA solutions during CIP, a standard cleaning regime used in beverage facilities. This adds to the portfolio of beverage patents granted to Radical Waters in the USA, China, Colombia, Mexico, Nigeria, Canada and South Africa, with numerous additional beverage patents in Europe, Indonesia, India, Korea, and Malaysia. 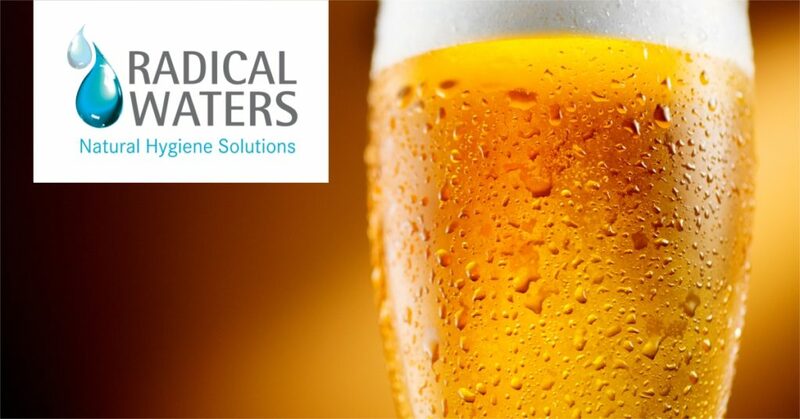 Radical Waters expects these patents to be granted soon, further strengthening its position as a preferred global ECA supplier in the beverage industry. Previously, beverage manufacturers would use traditional harmful chemicals to clean and sanitize to achieve similar results. CIP is used during production when changing from one product to another or at specific times for hygiene reasons to eliminate the growth of harmful bacteria often present in water rich environments. Traditional non-ECA chemical CIP steps are performed at high temperatures, and involve: a water rinse, followed by application of a detergent, followed by another water rinse, followed by application of a disinfectant, followed by a final water rinse, all of which require significantly more time, water and energy than cleaning with Radical Waters’ ECA solutions. Replacing traditional chemical CIP with Radical Waters’ green ECA detergent and disinfectant solutions eliminates the need for high temperatures and eliminates the rinse between the detergent and the disinfectant steps reducing cleaning to a 4-step process, which results in a considerable reduction in the loss of valuable production time. This time saving cleaning process also saves energy and water for the bottler, resulting in greater profits and a greener CIP process. The Radical Waters patented methodology helps beverage plants achieve sustainability goals, protect product & human life and improve profitability by providing, amongst others, the following benefits:Increased production time due to less time having to be spent on CIP; Total microbial decontamination;Reduction or complete elimination of costly and harmful chemicals;Savings on energy, with a reduction or elimination of the need to heat chemicals resulting in significant energy savings;Significant water savings;Flavour and residue elimination; and Improved safety for workers. The application of Radical Waters ECA technology for the CIP application in one of the world’s leading brewery plants achieved the following cost savings: Water savings of 83%; Time reduction of 43%; Energy savings due to cleaning at ambient temperature of 98%; and Chemical cost savings of 99%. In contrast to traditional chemicals, Radical Waters ECA Anolyte solution is produced and applied at a neutral pH, i.e. neither too acidic nor too alkaline, which makes it completely safe when in contact with humans and as an effluent in the environment. The ECA solutions can be used without any requirement for safety or protective gear. Radical Waters (Pty) Ltd has spent 22 years focused on developing and commercializing its patented green ECA technology. The company has installed operating devices on six continents and in 27 countries primarily for blue chip companies. Radical Waters’ products are used in a wide range of markets formerly dependent on chemicals for controlling contamination and bacterial infection. The company has a focus on markets that include beverage production, meat & seafood, sauce manufacture, milling & starch and hospitality. Radical Waters (Pty) Ltd produces devices in its factory outside Johannesburg, South Africa. Radical Waters International (UK) LLP in London is responsible for international distributor relationships. This entry was posted in About ECA, Press Releases. Bookmark the permalink.